It’s that season again. Halloween is in full swing here in Japan and everywhere you go there are more and more costumes and decorations for Halloween. While most of the festivities are centred on Disney Resorts, it is a huge season for them; all of the major shopping complexes are in full swing too. Themes of pumpkins as well as being able to buy Halloween related items are very popular. No more so than Tokyo Sky Tree. Tokyo Sky Tree is also in full swing with Halloween these days with a small pumpkin patch on their upper floor at the entrance to the tower itself. The tower is still as busy as ever and I still haven’t ventured up there yet. Solamachi is decked out with pumpkin decorations all over and most of the shops have at least one Halloween related item on display. Being a destination mall, they have to keep changing with the seasons in order to keep their customers interested. Even the big tower itself is partially lit up to represent Halloween. While the upper observation deck has a pink ribbon of light around it, the lower observation deck has something similar to an orange colour that I assume is to represent a Jack-O-Lantern. The orange light pulsates like a heart, or like a candle. Enjoy it now as it is likely to stop by the end of this month. 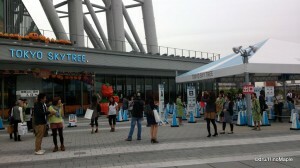 This entry was posted in Culture, Tokyo and tagged Disney, Disney Resorts, Halloween, Jack-O-Lantern, japan, pumpkin, Sky Tree, tokyo, Tokyo Sky Tree by Dru. Bookmark the permalink. I would love to also see more photos from you. I might head back again on Friday if I have time, but probably not. Can’t wait for Christmas. Halloween isn’t celebrated in South Africa, so it’s never been a big deal for me. 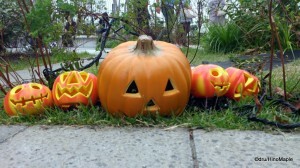 Here in Japan I notice the pumpkins – impossible not to – but then I promptly forget about it again. 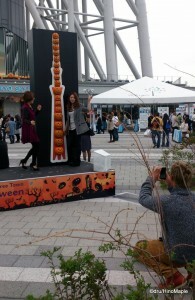 However, I will happily stare at pumpkins for hours if they happen to be Sky Tree pumpkins! We were lucky enough to see some amazing Halloween decorations at Tokyo Disneyland the last time we were in Tokyo. I’ll have to post some pictures. Would love to see that. Never been to Tokyo Disney, especially during Halloween. Went to Disney Sea this year for the first time though.